by Charity At the beginning of November 2008, Dianna David and I (Charity Zapanta) visited KPC after having been told by Dianna's childhood friend from Edmonton, Jodi Aguillion that we should go check out the place and meet Caroline Mangosing. On our first day meeting Caroline, we talked while devouring delicious burritos at a spot down just down the street. She versed us on how she came to take over the centre and it's mandates and connection to the Toronto Filipino community. She also proudly filled us in on all the film and theatre projects that she and Romeo Candido, have been involved with over the years as well as her experiences as a photographer and editor. It was so inspiring to hear firsthand about such amazing creative accomplishments achieved by fellow Pinoys. 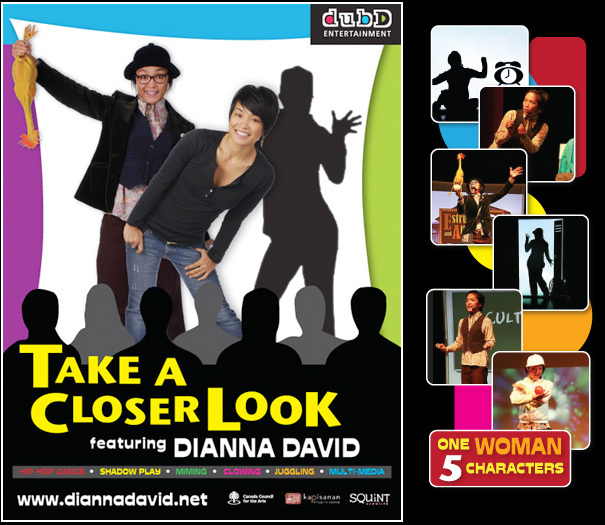 Prior to coming to Toronto, Dianna and I had created the first version of our show “Take A Closer Look” (formerly called the “The S.O.C (Sharing Our Creativity) Project”). We had come to Toronto to work with director Bruce Horak and was entering another phase of development with the show. When we told Caroline we were looking for rehearsal space during our stay in Toronto, Caroline graciously offered the use of the centre as a form of sponsorship for our show. Everyday we would wake up and be grateful we had a space to call our second home during our stay in Toronto. Being in a such a creatively supported space definitely helped our creative juices and inspiration flow. Since neither Dianna nor I have strong ties with any Filipino centres in Vancouver, we were easily drawn in by the instant Pinoy family support of Caroline and the rest of the KPC gang. We are so glad we made a cross-country connection to our new extended creative family. For Dianna, it was her first production where she was able to really showcase practically ALL of her talents as a Multi-disciplinary Artist. For myself, it was also my first opportunity for myself to delve into the world of performing arts as a co-writer and creative director. Take a Closer Look has been booked through the organization ArtStarts on an 89-show tour to 40 cities around BC. We have been on the road around BC since April 2 and will be returning home on June 4. We hope to come to Toronto and other cities in Ontario to feature the show. We are proud that we have created a story using the Filipino-Canadian experience to creatively inspires people to look beyond cultural and social differences and challenges people to embrace. For more information about the show and to keep up with what's going on with us, visit diannadavid.net as well as Dianna's blog diannadavid.net/blog.